According to the American Society of Plastic Surgeons, men’s cosmetic surgery is on the rise. Last year, men underwent more than 1.1 million cosmetic procedures in the United States. It’s not surprising; many men today understand that looking youthful, healthy, and fit is not only important socially, but also in the business environment. At Plastic Surgery & Dermatology of NYC, we offer a wide range of cosmetic procedures specifically tailored to men’s needs. Whether you want to reduce the signs of aging; sculpt and shape the body; reshape the nose; or improve skin tone and texture, we can design a customized plan that will have you looking your best and back to work as soon as possible. Find out more about men’s surgery options below. Liposuction is among the top three cosmetic procedures for men. Even if you maintain a healthy diet and exercise regimen, stubborn deposits of excess fat may accumulate in hard-to-tone areas. Problem areas for men include the abdomen, flanks (“love handles”), breast, and neck. Many of these areas are resistant to diet and exercise. Liposuction can help shape and sculpt the male body by removing excess fatty deposits in targeted areas. At Plastic Surgery & Dermatology of NYC, we offer a full range of liposuction options, from traditional tumescent liposuction to minimally invasive laser and ultrasound liposuction. 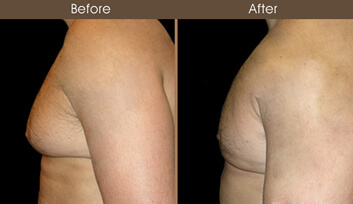 Find out more about liposuction for men. When men develop enlarged breast tissue, a condition known as gynecomastia, it can cause significant social embarrassment. For many men, gynecomastia is an inherited condition, and no amount of dieting or rigorous workouts can give them the sculpted masculine chest they desire. At Plastic Surgery & Dermatology of NYC, we offer a wide range of treatment options to remove excess fat and tissue, while improving the contours of the male chest. Advanced liposuction techniques require only minimal incisions, with limited patient downtime. If tissue excision is needed, incisions are carefully placed where they will be least noticeable. Dr. Levine will work with you to determine the treatment that best suits your specific needs. 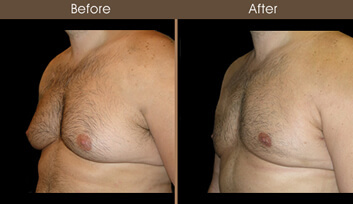 Find out more about gynecomastia surgery for men. According to the American Society of Plastic Surgeons, rhinoplasty is the number one cosmetic procedure for men. Dr. Elie Levine takes a truly customized approach for rhinoplasty to ensure that the nose is natural-looking and in balance with the patient’s overall facial aesthetics. Rhinoplasty can improve the size, shape, or proportion of the nose; remove a bump; reshape the nostrils; correct a bulbous tip; straighten the nose; repair defects from traumatic injury; and bring the nose into balance with the rest of the masculine face. Dr. Levine has expertise in all types of rhinoplasty, from the more straight-forward procedures to the most complicated rhinoplasty revisions (secondary rhinoplasty), including open and closed rhinoplasty, rhinoplasty to correct functional problems, and rhinoplasty for ethnic noses. Find out more about rhinoplasty for men. As we age, skin becomes more lax, facial muscles weaken, and natural fat stores begin to slip from their youthful position. The signs of aging around the eyes manifest themselves in many ways: puffiness and bags, hollowing under the eyes, even excess skin that droops over the upper eyelashes. The overall effect is to make the entire face seem older and more careworn. Blepharoplasty is a surgical procedure to improve the signs of aging around the eyes by addressing excess skin and prominent fat in the upper lids, lower lids, or both. In some cases, eyelid rejuvenation may be accomplished through minimally invasive techniques, such as temporary facial fillers, fat grafting, or laser skin resurfacing. Often, blepharoplasty is combined with browlift surgery for maximum rejuvenation. * Dr. Levine will work with you to determine the procedure or combination of procedures best suited to your specific needs. Find out more about blepharoplasty for men. Over time, the forehead and brow area can begin to droop, resulting in excess skin over the eyelids, wrinkling in the forehead, and creases between the eyes. A browlift elevates the brow into a more youthful position, while softening lines and wrinkles around the forehead and the eyes. A browlift may be performed alone, or in combination with other procedures, such as blepharoplasty, fat grafting, or laser skin resurfacing for maximum rejuvenation. * Find out more about browlift surgery for men. Over the years, sun exposure, stress, and gravity can leave their marks on the aging face. Facial changes occur across a broad spectrum, ranging from the development of lines and wrinkles, to sagging or hollowing in the midface and cheeks, to a softening of the masculine jaw line. A facelift can help rejuvenate the face and restore masculine contours by lifting and tightening sagging skin, while repositioning the underlying soft tissue into a more natural and youthful foundation. Find out more about facelift surgery for men. Loose skin, excess fatty deposits, deep muscle cording, and other signs of aging in the neck can detract from a once strong, masculine profile. Most of the time, these changes are brought about by advancing age, but sometimes genetics may play a role in the development of lax skin and excess neck fat in younger men. A neck lift can help tighten lax skin, remove excess fat, and create a sharper, more masculine jaw line. A neck lift may be done in isolation, but is often combined with a facelift for maximum results. * Find out more about neck lift surgery for men. As we age, collagen production slows and natural fat stores are depleted, resulting in a loss of youthful fullness and volume in the face and lips. In addition to the development of facial lines and wrinkles, we may see hollowed cheeks and thinning lips. Natural fat grafting can help restore youthful fullness, smooth lines and wrinkles, reduce bagging under the eyes, improve chin contours, and reduce other signs of facial aging. An excellent alternative to temporary facial fillers, fat grafting provides natural-looking, long-lasting results. * Find out more about fat grafting for men. How can I find out more about men’s surgery? Dr. Elie Levine will be happy to meet with you to discuss men’s surgery. Please call our office at 212-988-1800, or make an appointment online for a personal consultation in our New York City offices.